Antinea Boletsi was born in Athens, Greece. She obtained a Bachelor of Fine Arts degree at the University of Hartford in the USA before moving to Paris to attend courses on painting and sculpture at the Académie de la Croix Nivert. Since 2011, she has been involved with the art world. 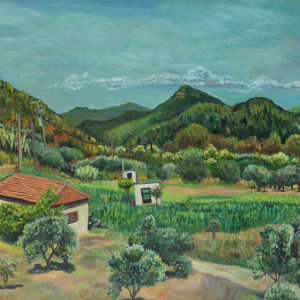 Landscapes, still lifes and portraits demonstrate the expressiveness and the simplicity of her art. Her paintings follow the rules of figurative art. They showcase beauty with the naivety and the intact talent of a child, but also with the sharp eye of a passionate observer. Antinea paints mainly in Greece and the UK where she lives, whilst she travels around the world. Her first solo exhibition took place at the C. John Gallery in Mayfair, London in December 2016.